To be successful as a cave hunter, that is a person who searches the countryside for caves, you must combine a variety of skills. In particular, by experience, the mind now tips me off to areas that are likely cave locations. A sound knowledge of sedimentary geology is helpful, understanding a little about physical geography will certainly add to your success, and most importantly, cave geography really tips the scales. In Ontario it helps to understand something about how glaciers influenced the landscape and of course the human interaction on top of that – in particular the tendencies of farmers over the last 150 years and their preference for plugging openings in their fields with coils of wire and other household debris. Jeff and I went out searching this past weekend and we found a likely cave location on this area of land above a valley. Thus far researchers have visited and dye traced the most obvious spring out to a resurgence in the side of the nearby valley. We followed along and tried to intercept a possible tunnel entrance. It seems to be that in some cases tunnels get bigger deeper in. In this case we found a large soil pipe that had the sound of rushing water flowing beneath its clayish plug. 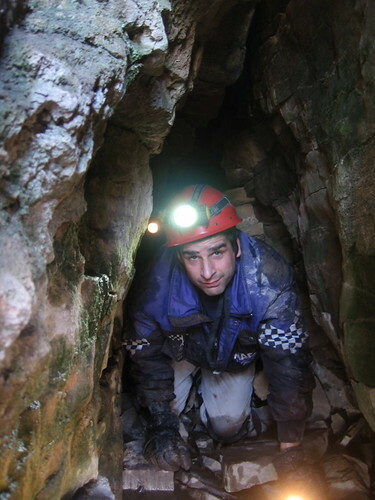 See the video here to learn more about how we search for caves in Ontario. The above picture is a spot near where we found our promising soil pipes – it is a blind valley where a small stream disappears under ground. This past Sunday JC and I took a little trip out into the insipid February sunshine. It was just warm enough to feel a taste of spring, you could smell the decaying leaves and the fungus in the soil. As usual we were following up on cave leads and in crawling inwards through a crumbling passage, Jeff discovered a small solution tunnel. There is something to be said for discovering caves where others have already been and discounted what was there because it seemed improbable and others have been there before. There were several places where we had suspected there might be tunnels, but it seemed that they all required tight and muddy squeezes. And having to ride in Jeff’s pristine 4X4 we were both reluctant to get too dirty. 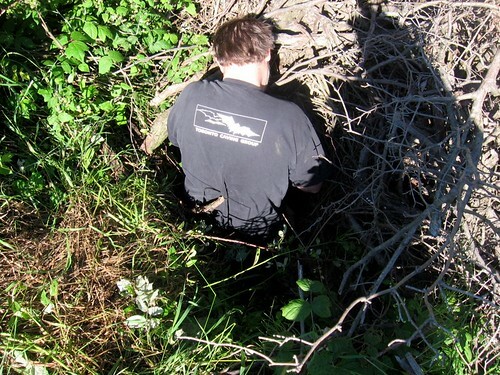 Opting for the sunny side of a low escarpment, I waited outside a crevice while Jeff crawled in to check it out. I was entertained by the antics of a vast colony of tiny black-headed birds in a tangle of vines along the cliff face. Suddenly they all went dead silent and a fellow hiker peered over to inquire whether I was following a path. Soon Jeff returned with a discovery. Admittedly the passage started like any other crevice cave, but in turning around a bend it suddenly adopted the classic shape of a solution passage in a joint. See Jeff’s pictures. For the worn rock slabs up top, the sinkholes and the springs that are flowing out along the sides of the plateau we are optimistic of better passages lower down. This coming weekend we expect to be busting into some virgin passage at Wasteland Waterway with Wolfmaan. It is another of our recent discoveries – this cave being large and challenging and at this time with an end that still eludes us. No doubt Wolfmaan will take some high quality video. After discovering caves the next logical step is exploring caves and that is exactly what we intend to do. There is a spot in Wasteland Waterway beyond which we haven’t ventured. Our intent will be to squeeze beneath a rock that Jeff had named the ‘aerofoil’ and from there a short squeeze through the ‘porthole’. It will take us into nowhere land. From what I could tell the tunnel widens out beyond the porthole. At Wasteland Waterway we are already into a significant passage that is dropping down deep and stretching high in places. 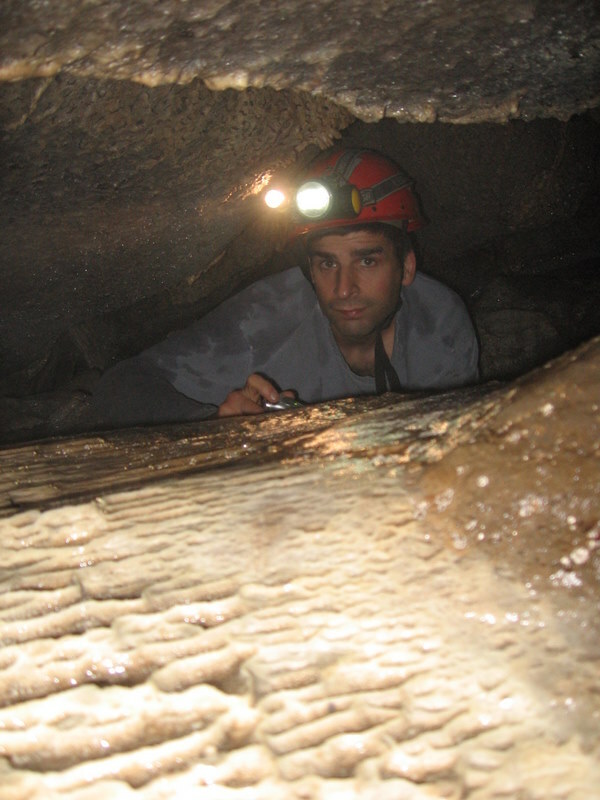 For more on the discovery of Wasteland Waterway check out my book on caves, ‘Caving in Ontario; Exploring buried Karst’. 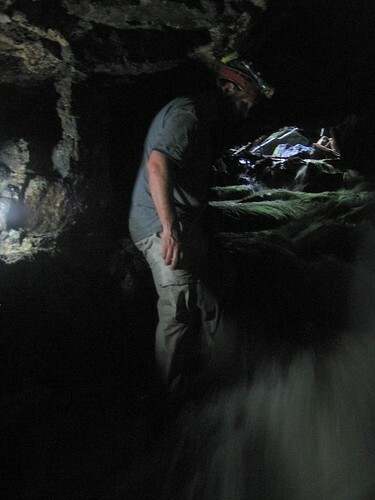 For more on Skull Cave check out Jeff’s map and pictures here. To hear more of our exploration this coming weekend visit again. A cave in marble – Ontario, originally uploaded by Mic2006. Subject to my failure a few years ago to find a particular marble cave I have always felt this sadness whenever anyone mentions Ontario Marble caves. Well this coming Tuesday I am again going to attempt to locate the “P-Lake Cave” and photograph the beautiful stream that runs within. This picture was taken of me in another Ontario marble cave. It’s rather a grim and rainy day outside and I’ve spent most of it here in front of my computer – working on my soon to be released book “Caving in Ontario; An exploration of Karst”. The name may have changed a little since I last mentioned it, but I think this title better captures the true content of the material. Here is part of the foreword and if you are waiting (and I know some are) you will not be disappointed. I am taking longer than expected because the work needs to be perfection. “Caving in Ontario” has been written as my second book on Ontario caves – the first being “Rockwatching” which was published by Boston Mills in 2005. How do I become a Caver? A question that is commonly asked by people who visit this site is, How do I become a caver? or, How do I start caving in Ontario? Well, aside from the obvious (start caving on your own) Join a caving club. I had been caving for many years as an independant before I joined the Toronto Caving Group. I had initially taken a caving course in the army while I had been stationed in Gibraltar but that only covered the basics of sport caving. To really cave as an independant required far more knowledge than that. A caver needs to know how to find caves and short of that knowledge, you need to align yourself with people who already have that skill to learn. Your first caving trip with the TCG (Toronto Caving Group) will likely be to the Niagra Escarpment caves (e.g. Mount Nemo or Rattle Snake Point), but after that, and with the appropriate contact (That you will make in the club) your horizons begin to expand. Later caving trips might be down to Dewdney,s or Moira caves and then later with more experience – Friars Hole in West Virginia. Somewhere along there you begin picking up the skills to progress further in the field of caving. This picture was taken yesterday and it is above a new cave that Jeff discovered last weekend. The cave (“Bed of Glass”) is buried beneath a pile of rusting wire fencing and old car parts. 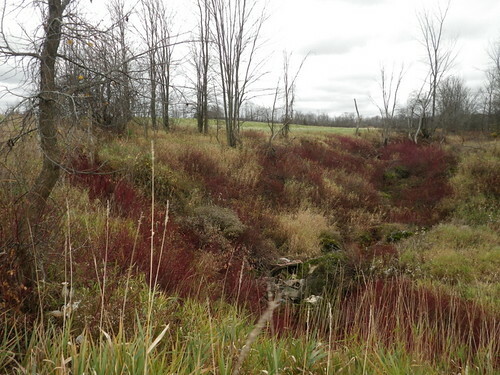 A dry stream weaves through a nearby woodlot and disappears beneath the big pile of crap. Jeff had made a hole and down this hole we went. My first task had been to ascertain the absence of snakes. I had seen several in the grass that day and I hate snakes. Nowhere more appealing to snakes than beneath a big pile of garbage just like this.